The United States welcomes today’s announcement of certified results in the first round of the Afghan Presidential elections. We congratulate all candidates in this historic race, and applaud the vigorous campaigns run by President Karzai and Dr. Abdullah, garnering support across the country and ethnic lines. As neither of the top two candidates received more than fifty percent of the vote, the Constitution calls for the holding of a run-off. 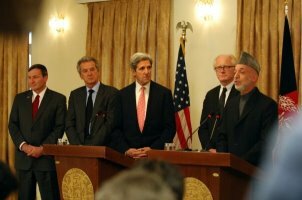 We welcome President Karzai’s statesmanlike acceptance of this result and his agreement to a second round of voting. 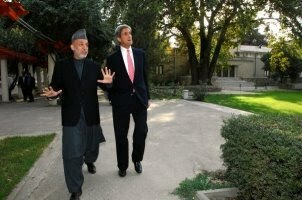 The United States commends the Independent Electoral Commission (IEC) and the Electoral Complaints Commission (ECC) for fulfilling their mandates, working in coordination with one another to ensure that the electoral and adjudication processes were carried out under Afghanistan’s Electoral Law and according to international standards. Read the whole thing and view the photos here. Looks like our man of the hour in Afghanistan is no other than Senator John Kerry of the Senate Foreign Relations Committee. Photos below from the US Embassy Kabul’s Facebook page. 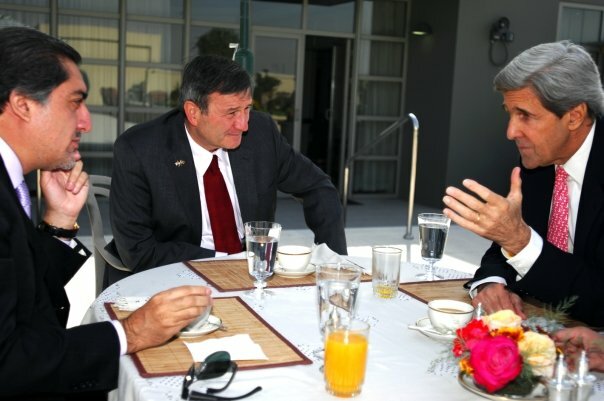 Makes one wonder where in the world is the Special AfPak Rep, Richard Holbrooke? Who Will Sink Al Franken’s S. Amdt. 2588? The H.R. 3326 Department of Defense Appropriations Act 2010 bill was passed by the House on July 30, 2009, and by the Senate on October 6, 2009. GovTrack’s last update on Oct 19, 2009 12:11pm indicates that the bill may now proceed to a conference committee of senators and representatives to work out differences in the versions of the bill each chamber approved. The bill then goes to the President before becoming law. The amendment was prompted by this victim who was gang-raped in Baghdad. The victim according to Mother Jones was “forced into mandatory binding arbitration, a private forum where Halliburton would hire the arbitrator, all the proceedings would be secret, and she’d have no right to appeal if she lost.” It took three years just to get the court to agree that she can sue. Read more here. What? That sounds like a cracker bonbon! RfR asks, “Whats the big deal?” and writes: “The 2010 Franken Senate Defense Appropriations Amendment overreaches into the business of private enterprise. Defense contractors are a part of the functioning free market; not the Federal Government. A handful of isolated assaults is no reason to summon the interference of the Federal Government and Congress. This amendment interferes with the privacy of companies and the ability of our defense contractors to effectively conduct the business of protecting America from terrorism.” Read here why RfR exists. Yeah, right, of course. This is nothing but a political amendment and has nothing to do with protecting working people. Yes, enforcement would be problematic, wouldn’t it? And expensive. They may have to add a few more millions on the government’s tab. Oh, heavens! They may have to spend more time screening people before they send them off to work in the red zones! Holy mother of goat and all her crazy uncles! The business of America is business, but at what cost? See that’s actually 30 out of 100 United States Senators who voted in favor of business interests over the rights and dignity of individual victims. Congress could pass laws cutting off highway funds to States which didn’t raise their drinking age to 21 but some legislators don’t want to do anything about this because well, what if these companies don’t want to work for the taxpayers anymore? Then what? Yep, where would they be if they can’t bid on our lucrative contracts? This makes me want to weep and throw my shoes at the somebodies. Really. If Liz Were Queen posted yesterday that there is talk that the Senate Majority Leader Harry Reid (D-Nev.) may allow this amendment to be stripped out or watered down. She also has a list of talking points in her site when talking to your representatives. Go, please call 202-224-3542 and tell the Majority Leader not to strip or water this down. Call the Capitol switchboard at (202) 224-3121 and tell your senators to keep the Franken Amendment, S.Amdt. 2588, in the defense appropriations bill. Oct 22: Who’s Storming Which Door to Sink Al Franken’s S. Amdt 2588? From Valedictory Despatches to Twitter? Today on BBC Radio 4 Matthew Parris kickoffs a 5-episode program on the passing of the valedictory despatch. That’s the traditional final telegram home in which British ambassadors could “let their hair down and settle a few scores.” That is, they could say whatever they wished in their final telegram home. The series features declassified Foreign Office files alongside interviews with the diplomats who wrote them. These files were released to the BBC under the Freedom of Information Act. Click here to hear the episodes. Click here to hear a clip now (additional excerpts read by actors). The BBC also interviewed our blog friend, three times British Ambassador Charles Crawford, who left the FCO in 2007. Ambassador C gave it a thumbs up: “The BBC series is well researched and should be well worth a listen if you are interested in the way diplomacy has evolved, both for better and worse, in recent decades.” He further writes that the valedictories were canned when he was in Warsaw, and that he sent two from there: “– one on the philosophical aspects of the end of communism in Europe (extracts from which readers in a world scoop here have seen: The Final Submission); — one describing my Lifetime Career Oscar Achievement Awards, a self-indulgent but droll list of the best and worst moments of 28 years’ service.” Read Charles’ post here. You can read below some of the valedictory despatches (pdfs) included in the series. Apparently, hours after this telegram was sent, ambassadors then received word from Whitehall that the practice was to be discontinued. The report says there was concern for the “growing tendency of these valedictories to leak.” That or could it be that they no longer write them “mainly because no-one is interested to read anything longer than a text message?” Or perhaps a tweet at 140 characters? Man, you can start a whole new lit genre writing valedictories in Twitter. Except that Whitehall would cringe at that and Foggy Bottom has not done these type of dispatches; and well, it also doesn’t tweet goodbyes. Of course, if they come around to it, and your valedictory is longer than 140 characters, you can fix that with Twitzer – a Firefox extension for Twitter that will short tweets that seem to cross the 140 limit. Once installed, the extension will fetch all the Twitzered text from shortText.com and update the Twitter site itself.